Thanksgiving is almost here – how did that happen? Each autumn we come to Vegas, and each year even though we extend our stay a little bit longer, it never feels like enough time. I had so many home improvement projects that I wanted to tackle. Far too ambitious those goals were, but I did manage to check off at least a few tasks. Some DIY home decor now hangs on the walls, a few gently used pieces of furniture have been purchased. The current project – digging holes in the yard for 4 fruit trees that I’ll put in the ground in 2016. What the heck is this girl thinking – it’s such a small yard! Well, I’m going to prune those suckers so they fit, also going to do some espalier. I’m still dealing with post-cruise vertigo, which is worse whenever I look down (ugh! ), so you can imagine how the hole digging is going – my brain is tricking me into thinking I’m on the roughest of seas! I’ve just about finished one hole about 20 inches in diameter and about the same deep, and this ain’t loamy soil, folks. It’s riddled with boulder-like rocks! Thank goodness Hubby stepped in for a bit to help with the digging – he accomplished in minutes what would have taken me all day. While I’m out there laboring, the dogs chill in the sun. Periodically, I’ll flop back onto my bum a sweaty nasty dizzy mess, and observe the furry babies savoring time outdoors. What a wonderful, carefree life they have. We missed them so much while we were on vacation. At one point, the one moment during the whole trip that hubbie and I got at all tipsy, we confessed to each other that our love for our furry ward, Lucy, has grown so great that it would be really hard at this point to say goodbye. Well enough of my personal updates. I have a crafty share for you today! It hasn’t been confirmed yet, but I’m pretty sure we will be hosting Christmas for hubby’s side of the family this year. So the preparations have already begun. Well the fun ones, at least. We won’t talk about the wall painting that needs to be done or the molding that’s been in a pile, collecting dust for the last 2 years lol. We can no longer use the, “We just moved in” excuse. So I had a chance to play with some recently acquired dies and embossing folders and lickety split I was able to craft a precious wreath, one of three identical ones that I will hang in my home this christmas. Let me show you how I did it! To start, I die-cut a base for my wreath using a piece of old corrugate and 2 circle dies from Sizzix’s Circles Framelits Plus Die Set. Generally, wafer thin dies are meant for cardstock and not much thicker, but this corrugate cut just fine, probably because the corrugate wasn’t heavy duty and the shape wasn’t intricate. This die set has a whopping 15 dies in a basic, infinitely useful circle shape, and they range in size from smaller than a dime to a large circle which would fit the 9 inch wide cutting platform of the new Sizzix Big Shot Plus Manual Die-cutting Machine. I hot-glued two of these corrugate wreath bases together to make a flat, lightweight (important for hanging), and upcycled/free base for my project. Next, I die-cut several lovely leaf shapes from felt using the Millinery Leaves Bigz die from Brenda Walton’s new collection. If you have a lightweight felt, you might want to iron on some fusible interfacing before die-cutting like I did. This one little step added just that extra kick of stiffness that will make this wreath one that looks fresh not just this year, but for years to come. This die comes with an embossing folder that will add veining to your leaves! Lurve. For your Sizzix sandwich, you will place your die-cut in the folder, place the loaded folder between your 2 cutting pads, put it on top of your multi-purpose platform open to tab 1, and send it through your Big Shot. Hot glue your leaves to your base, add a bow, and you’re done! OMG I love how this turned out! Rustic, muted, clean oh yeah! I’m also getting a head start on Christmas cards. The new Library Pocket Bigz XL Die is so hot that it is selling out quickly – check your LSS! Many of my crafty colleagues are snatching it up because it just has such crafty potential. In this case, it will perfectly house a Christmas card, extra little love notes, the bookmark that die-cuts from the same die, ephemera, and probably a gift card or two for the niece and nephews. I think it would be fabulous for those of you doing December Dailies. 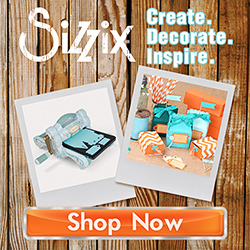 As with all the Bigz type dies, your Sizzix Sandwich is simple – place your die and cutting material between your 2 cutting pads and send the stack through your Big Shot. I die-cut some beautiful patterned papers from Authentique, which I will be using for a lot of my holiday decor this year. Their fall and winter collections this year make me swoon! Since these patterns fall on the vintage side of the crafty spectrum, I distressed the edges of my die-cuts a bit to play up that feeling. For my little love notes, I used the Inserts & Envelopes, Mini Bigz Die. So cute. I can see these working well for hidden journaling, too. Here’s a close-up of the cute bookmark and reinforcement that are cut with the Library Pocket die. For a little extra texture, I also hot-glued one of my embossed leaves and a simple button to the front. I can’t wait to use that Library Pocket to make other upcoming occasions extra special… like a certain someone’s birthday! Well, I hope you enjoyed my projects today. I’m going to try to fit in one more before the trek back to California. Otherwise, have a splendid Thanksgiving! I hope you celebrate with good friends, good food, and much gratitude. Tags: Authentique, brenda walton, cardmaking, christmas, December Daily, Die-cutting, DIY, gifts for crafters, handmade, papercraft, sizzix, tutorial, Wreath. Bookmark the permalink. Vivian, it’s nice to have you blogging again. I have missed you and your projects. Great start to Christmas. That wreath is oh so vintage. The card is lovely. There are so many yummy bits and pieces. Happy Thanksgiving to you!